"Lizzy!! We have to get going!! NOW!!" Mom called. "Coming Mom!" 14-year old Lizzy called back. "Why is she in such a rush? It's weird to go on vacation to her friend's house--I mean really, that's pretty weird!" Lizzy thought as she grabbed her stuff and ran out to the car. "What took you so long?!" Lizzy's 8-year old brother Jackson asked once she got into the car. Lizzy looked back to him and said, "Why does it matter to YOU?" Then turned around and started a "conversation" with Mom. "Mom? Why can't I have a phone? I wouldn't be so bored otherwise!" Lizzy said with a teenage attitude. "Lizzy... You already DO have a phone! I only took it from you so that it can't distract you this month." Mom answered. Then Lizzy suddenly remembered. A month. A WHOLE month she is going to be around horses. Talk about a vacation! This sure is a vacation alright! That also means that she wouldn't see Dad for a whole month. Who would trade home for horses?! Not Lizzy. But she had no choice. She had to go. "We're here! We're here! We're here!" Jackson jumped up and said. Lizzy sighed and said quietly, "Great! Can't wait.. no." She got out of the car and saw that she was standing almost face-to-face with a horse. She jumped and did a slight scream but the horse didn't even flinch. "Wow!" Lizzy said, but scared the horse. "How did I scare you when I said one word, but not when I screamed?!" She told the horse as she walked over to Mom. "This is it!" Mom said and looked at the house. "Yay! Where will I be staying, Mom?" Jackson jumped out and said. "You'll all be stayin' in the house." Suddenly someone said from behind them. Lizzy jumped and looked back. She saw a guy probably around her age coming towards them. "Sorry if I scared you. I'm Aiden. You must be Mom's friend right?" He said first looking at Lizzy, then to Mom. "Yes! Yes I am and this is my daughter Lizzy and my son, Jackson. Nice meeting you! So where is your Mother?" Mom said. "She's in the barn right now but I can show you where you'll be staying if you want." Aiden offered. "That'll be alright! We'll just get our things from the car first." Mom said while walking over to the car. "Need any help?" Aiden asked. "Yes, if you don't mind." Mom replied. He grabbed some bags from the car. Soon, everyone was ready to go to their new room. Lizzy rolled her eyes at the thought of staying here with horses. Aiden then showed them to their rooms. "At least I don't have to share a room with Jackson!" Lizzy mumbled as she threw her bags onto her bed. She started fixing up her room with all the stuff she brought - which is a lot! Mom walked in to check on her and saw a pile of stuff on her bed. "Why did you bring so much stuff, Lizzy! We're only going to be here for a month!" Mom said once she saw how big the pile actually was. "A MONTH?! That's a long time! I need to make it feel a LITTLE bit like home here!" Lizzy exclaimed. Mom walked out and Lizzy looked out her window. "Great. I have the perfect view of all the horses. Just what I need to finish it off." Lizzy thought to herself with a sigh. Lizzy was about to sit down on her bed when she noticed something. "A horseshoe? On the wall? Great decoration. Love it..." Lizzy said to herself while taking it down. She set it on the small table next to her bed. "Nah, I'll put it in the drawer." She thought then opened the drawer and set it inside. She made her bed and put her clothes in the dresser across the small room. When she was done, Mom walked in and said, "Lizzy! We're going on our first trail ride here!" Lizzy looked at her and said, "I'm not coming." "Well then you'll be here alone, never mind, Aiden's staying here so if you need anything just ask him." Mom said. "Bye, Lizzy. But you'll have to ride sometime." Mom answered as she left the room. Lizzy sighed as she watched her Mom and brother mount their horses and ride off. Once they left, Lizzy walked out to the barn. Once she got there, she looked for the horse that she would ride if she had to. "Didn't you go on the trail ride?" Lizzy heard a voice say. It was Aiden. "Uh..no. I decided not to got today." Lizzy replied. "What are you doing in the barn?" Aiden asked. "I just wanted to check out the horses." Lizzy said. "Well then, I know just the horse for you." Aiden said while motioning her to come. Lizzy came over and he pointed to a stall across from him. "Why her?" Lizzy asked. "She's just like you." Aiden explained. "How?!" Lizzy demanded. "I'm not a horse, you know!" Aiden looked at her and answered, "Well, look what color she is." 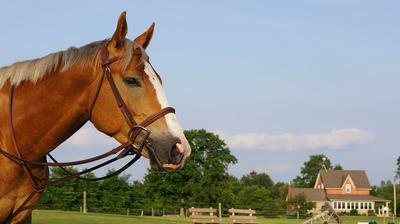 Lizzy looked and saw a beautiful Palomino-colored horse. "What breed is she?" Lizzy asked with some interest. "She's a Morgan." Aiden replied. She went over to pet the horse. "What's her name?" Lizzy asked. She asked a couple more questions and she finally asked her last one, "What's her personality?" "That's another thing that makes her like you. She is very nice but can be stubborn. And she's really friendly but can have some attitude." Aiden smiled and said. Lizzy gave him a sly look then couldn't help laughing. "I guess she is like me. We both have blonde hair or palomino hair, and same personality, even the same age!" Lizzy said. "Do you want to groom her?" Aiden asked. "Sure. But I don't know how." He smiled and showed her how. Soon, she was grooming her non-stop. Time went by and soon her Mom and brother were back from the trail ride. Please read my story! I love yours! Please read my story it is called Midnight the Black Stallion and please comment on it too! I really like your story! Please write more! Thanks! I saw your comment, and I'm continuing the story! Please write more of this story! I love it! And please, can everyone read my story, Aroura, the Appaloosa, and comment? It has about 10 chapters already!